Reaching your 21st birthday is an important milestone in life. It's a time of celebration. Unfortunately, it can be a day of tragedy, as it was for Jason Reinhardt. Reinhardt turned 21 this year. On his birthday, he died from an overdose of alcohol, while trying to consume 21 drinks in an hour. Jason's mother, Ann Buchanan, hopes the death of her son can shock young people into realizing that alcohol is legal, but lethal. Moorhead, Minn. — Minnesota State University, Moorhead is a dry campus. But if you're a student, you can always find a place to drink. Jason Reinhardt did. He'd been a student here. He was a member of a local fraternity. Reinhardt spent his 21st birthday partying with fraternity friends at a local bar. Following a ritual known as the "power hour," where kids turning 21 try to throw down 21 drinks in an hour. Reinhardt made it to 16. That night he slept at the frat house. Friends say when they checked on Jason, he was fine. But the next day, Reinhardt was found in bed lying in his own vomit. He was dead. For Jason's mom, Ann Buchanan, March 15 is a tragic day. "I have always had a premonition that I was going to lose one of my boys," says Buchanan. "Twenty-five years ago on the Ides of March, my parents were killed in a plane crash. Then Jason was born on the ides of March, and the family thought, 'Oh good, we've finally had something positive happen on the ides of March.' Then, Jason passed away on the Ides of March, so it's been haunting." Jason Reinhardt was the oldest of Buchanan's three sons. She says he was a good kid. An "A" student. There were no discipline problems. Jason was dependable and trustworthy. He got his first job -- delivering newspapers -- when he was 13. Since Jason's death, Buchanan has talked with his friends. She's learned that Jason was no stranger to alcohol, but his behavior at parties showed he could drink responsibly. "He chose to have one drink, he babied it for an hour. He made sure he was eating. He just had one drink every hour," says Buchanan. "So in a way, Jason's power hour was his first time for binge drinking. His first and his last." Jason Reinhardt's death shocked the community. But it's not an isolated incident. A week after Jason died, two 15-year-old girls were arrested in neighboring West Fargo. The girls were found walking down the street intoxicated. They were taken to a local hospital for treatment. Then, during a local basketball tournament, two teenagers were found passed out in their hotel. They were rushed to a hospital. One of the kids had her stomach pumped for alcohol poisoning. These are just the incidents the public knows about. There were surely others that were less serious or went unreported. Kevin Thompson is a professor in the Criminal Justice department at North Dakota State University. Thompson has done extensive research on alcohol and drug use. He says it's common for underage drinkers to end up in the emergency room. "We have maybe five to six incidents a month in Fargo, where a person has the potential to die," says Thompson. "Where their blood alcohol level probably exceeds .35." The current standard for drunk driving is .10 -- and will soon go down to .08 in Minnesota. Thompson says a blood alcohol level of .35 is the danger point. Most people will pass out or dehydrate, and they'll begin to vomit. Thompson says the news gets worse. "If you talk to the addiction counselors in the community, they'll tell you they're seeing kids as young as 11 or 12 who are drinking fairly heavily," says Thompson. "At 13, they're dabbling in marijuana. At 14, they're looking at ecstasy and other drugs. So it's starting earlier." On a recent Friday night on the campus of North Dakota State University, Alpha Gamma Rho is holding its second annual booze-free beach blast. Organizers expect 300 people. Chris Staiger, president of the fraternity, says they support campus regulations on liquor. NDSU does not allow alcohol. "That's why we have three security guards from NDSU here. They'll be working for the evening. No bottles will be allowed in, even if it's just pop or anything like that. It potentially could be mixed with something. So we're not going to let anything into the building," says Staiger. "But, it does happen though. People can sneak it in pretty easy and we'll be watching for it. If somebody does start looking like they're becoming intoxicated or does have alcohol in their system, we will ask them to leave." Staiger says having this party at a building owned by the college helps takes pressure off the fraternity. They have to follow the rules. In fact, throwing this party at the frat house wasn't an option. Even though they can legally serve alcohol there, since it's off campus, they couldn't hold a party. Relatively new restrictions make it clear who can drink, and when, at the Alpha Gamma Rho house. "Alcohol has to be limited to only three people in the room at one time. It cannot be minors, it has to be 21," says Staiger. "These are some of the rules that inter-fraternal council and NDSU established. We are just trying to change the mindset of the house and be as careful as we can." Staiger says more of his fraternity brothers want stricter control over alcohol. He expects the fraternity will soon ban alcohol from its house. He says the group is trying to make the fraternity a safer place. But drinking on campus still occurs. A study released by graduate students at North Dakota State University recommends alcohol be allowed on campus. The study says drinking will happen whether it's banned or not. Fargo Police Chief Chris Magnus is not the most popular person at NDSU. During his tenure, Magnus created what's called the party patrol -- an effort to crack down on underage drinking off campus. Magnus says minors who drink are breaking the law. Even worse, they don't understand the potential dangers of alcohol. "Do kids even understand the chemistry of how alcohol affects them? We find, surprisingly, that a lot of kids are really woefully informed to this extent," says Magnus. "They simply do not understand, and frankly many adults don't either." Magnus says adults play a critical role in determining drinking habits. He says too many adults view drinking as a predictable part of growing up. He says attitudes must change. "Those behaviors that we engaged in were stupid then, and they're stupid now," says Magnus. "They're not something we have to continue to accept, and to say is a rite of passage. How can putting yourself in a position of complete powerlessness be a rite of passage?" Three years ago, alcohol cost another student his life. Ken Christiansen, a student at the University of Minnesota, Duluth, was drinking at an off-campus party. On his way home he fell into a creek and drowned. UMD Chancellor Kathryn Martin says the college made a very public effort to change the environment on campus. Students caught drinking are ticketed, fined and sent to classes. Martin says school officials pay closer attention to warning signs of trouble. If a student is skipping classes, or ticketed repeatedly for alcohol infractions, their parents are notified. Resident assistants in dorms are trained to identify signs of alcohol poisoning. Martin says the training saved one girl's life. "A resident hall assistant saw her when she came in and because of the education he received, realized that this was a serious problem," says Martin. "He called 911. We got this woman to the hospital. Her life was saved. She received her citation and had to go to the alcohol educational awareness classes." Martin says the girl's parents were thankful. They told her the intervention probably saved their daughter's life. In Moorhead, it's difficult to determine what affect Jason Reinhardt's death has had on students. Minnesota State University officials say optional classes warning students about the dangers of alcohol were available before Reinhardt died. There are also peer education programs, where upper classmen mentor new students about campus life. Senior Jamie Tate works in the peer counseling program. Tate says students have taken notice of Jason Reinhardt's death, but people's behavior hasn't changed. "Everything from going out and just hanging out and having a good time and being responsible, to ending up passed out in front of a resident hall and vomiting on themselves," says Tate. "The stories really haven't changed that I've noticed." Tom Johnson is having a smoke between classes. Johnson, 20, is unaware the university offers alcohol education classes, and he has no plans to sign up for one. "Well, I never get to the point where I can't function or I'm vomiting constantly or anything like that," says Johnson. "I say, you learn on your own. Because you realize what's the point of getting so trashed you can't even talk, you can't do anything." Some students say Jason Reinhardt's death was an isolated incident, an unfortunate accident. They say his death won't affect their behavior. They believe attempts to place tighter restrictions on drinking are a waste of time. Landon Ascheman, 23, says kids will drink regardless of any restrictions. Ascheman says he doesn't think underage drinking is that big a problem. In fact, he says the legal drinking age should be lowered. "They're trying to reinstate the draft for one. If you can get drafted into the military at 18, you should be able to drink at 18," says Ascheman. "You pay taxes, you do everything that an adult is required to do, you should be able to have the privileges that an adult is allowed." Addiction counselors say college may not be the best time to change someone's attitude about alcohol. It may already be too late. Ann Buchanan is testing that premise. Since the death of her son, Buchanan has made it her mission to prevent another tragedy. She speaks to high school kids about Jason. 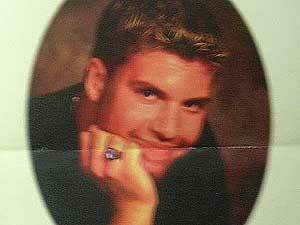 Buchanan stands before a health class at Moorhead High school, and places a framed picture of Jason before the class. She tells them how Jason's death has affected his brothers. "What's really sad is to see a 9-year-old consoling an 18-year-old. That just breaks my heart," says Buchanan. "No nine-year-old should have to console a brother." Some of the kids shrug and look disinterested. Many seem shocked. A few stare with their jaws open. Even though they're only sophomores, some of these kids have first-hand experience dealing with alcohol poisoning. Jaymie Janish helped two kids who overdosed. "I just sat in the bathroom with them, and you do not notice a thing, until someone said, 'Look at them.' And his body is white and he pointed to his wrists and they were bright blue," says Janish. "It was like looking at a dead person." Janish says her experience, and listening to Buchanan, made her realize drinking is dangerous. Sara Enns says hearing Buchanan's talk was an eye-opener. "You have someone right in front of you, telling you this is what can happen. My son died," says Enns. "Like, something that bad can happen. It makes you realize that not everyone does it, you don't have to do it." Enns says she tried drinking. She says she was lucky enough to get caught and hasn't done it since. Now she plans to wait until she's of legal age to drink. Classmate Adam Gangl says hearing Buchanan's story made him realize there can be serious consequences from drinking. "It wasn't just like a name in a book. It was this person's mother telling us," says Gangl. "And listening to her like, stifle tears. It was a lot more emotional and it had a much greater impact than just learning about it." Ann Buchanan says talking to high school kids about Jason's story is therapeutic. She says making kids understand that alcohol can be lethal is her mission. Buchanan says if just one kid out of every group she speaks to decides not to drink to excess, then her son's death was not a waste.